For someone who genuinely did not like scones, I have been baking rather a lot of them recently. I have concluded that homemade, or well made bakery scones, are a million miles away from the prepackaged, heavy, scones of my past. 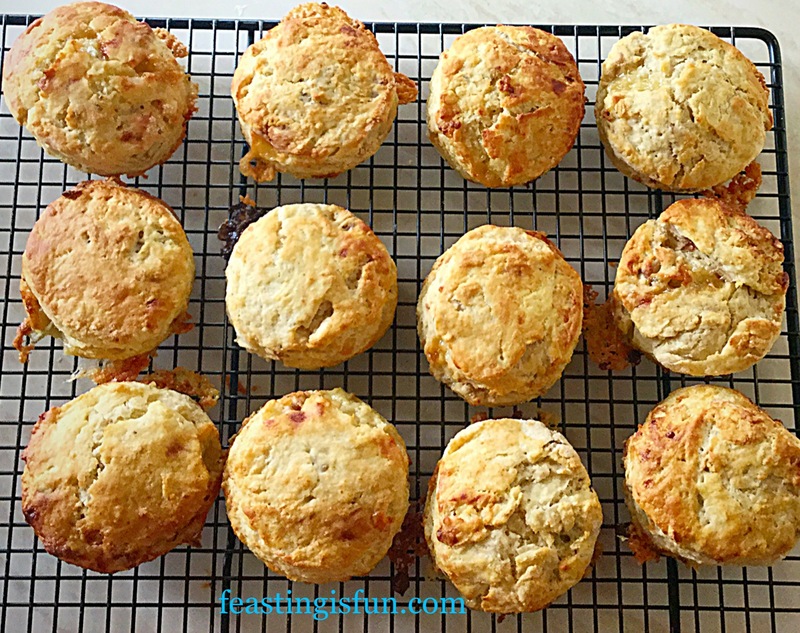 During my recent scone bake-a-thon I adapted my Super Light Scones recipe to create an all butter version, which makes the most delicious savoury scones. Welcome my Beauvale Cheese Walnut Scones. Beauvale Cheese Walnut Scones fabulous served warm. 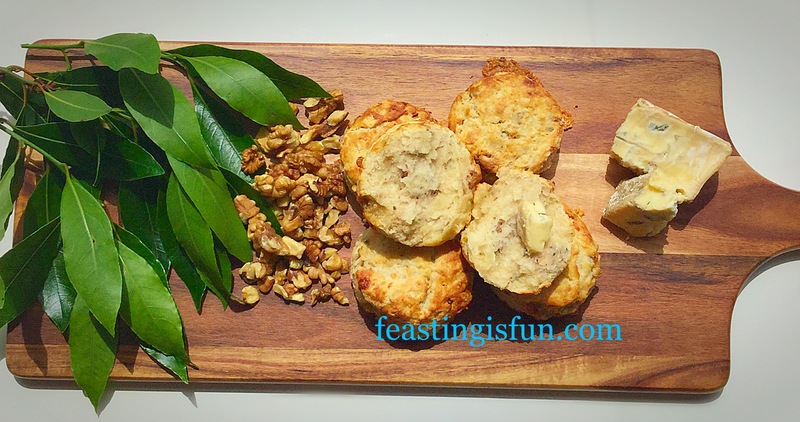 These Beauvale Cheese Walnut Scones are incredibly tasty and two out of our three children loved them. Let me add that they would not eat blue cheese on a cracker. A massive win for me as a mum! 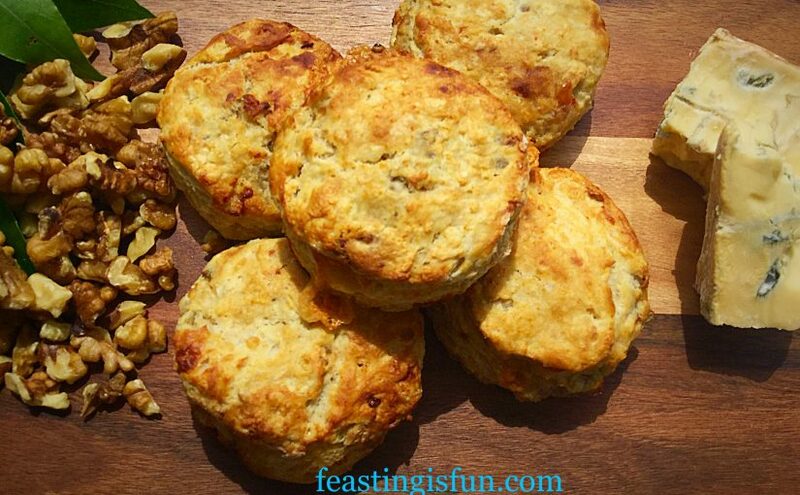 Beauvale Cheese Walnut Scones perfect for lunch, picnics or just because they are so good! Truly though, their taste is a reflection of just how much delicious flavour is packed into these scones. The salty melted Beauvale Cheese, against an all butter scone, with the crunch of toasted walnuts and balanced with just a hint of honey. I bet you didn’t see that last ingredient coming? Because blue cheese and honey pair beautifully together, I was going to caramelise the toasted walnuts in honey. Finally though, I decided that I wanted the sweet honey to be no more than a kiss on our tastebuds. 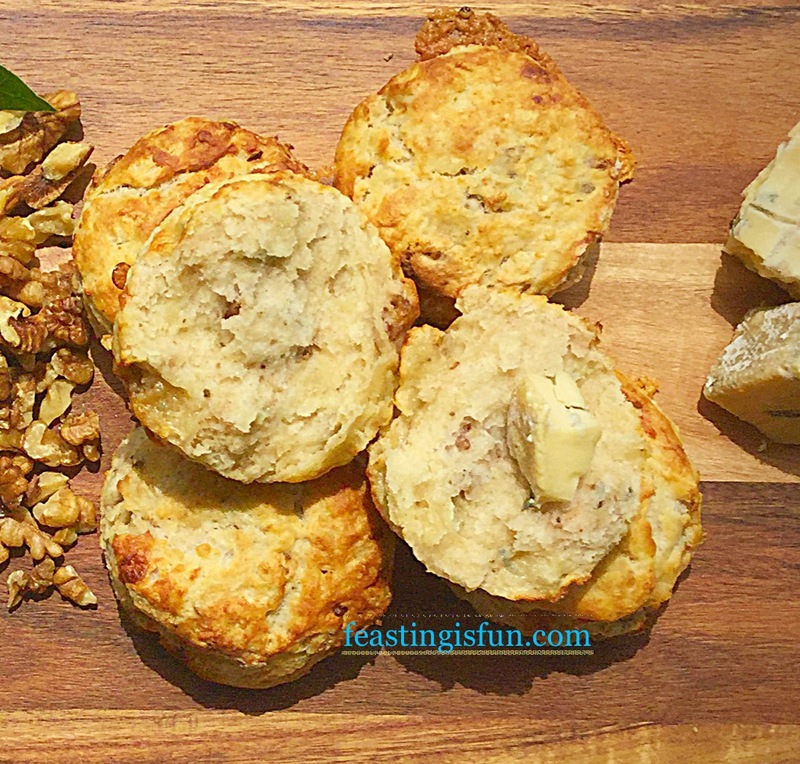 Beauvale Cheese Walnut Scones a buttery cheesy scone with added crunch. Beauvale Cheese is a soft blue cheese, that doesn’t have the intensity of Stilton. Beautiful eaten with bread or crackers and served on a cheese board, this cheese comes alive when baked in the scones. Warm and melted, it has a rounder, salty and buttery flavour that blends nicely with the toasted walnuts and that little hint of honey. Try these Beauvale Cheese Walnut Scones, they are incredibly simple to make and are perfect for using up leftover cheese. In a dry iron skillet or frying pan add the walnut pieces and place over a medium until lightly toasted. You will just be able to start smelling the wonderful walnut oils. Remove from the heat and set to one side to cool. Into a large bowl sift the flour and baking powder. Add the sea salt and pepper. Using the large grating side of a box grater, grate the very cold cheese straight onto the flour – I find it easier to have my bowl on digital scales. 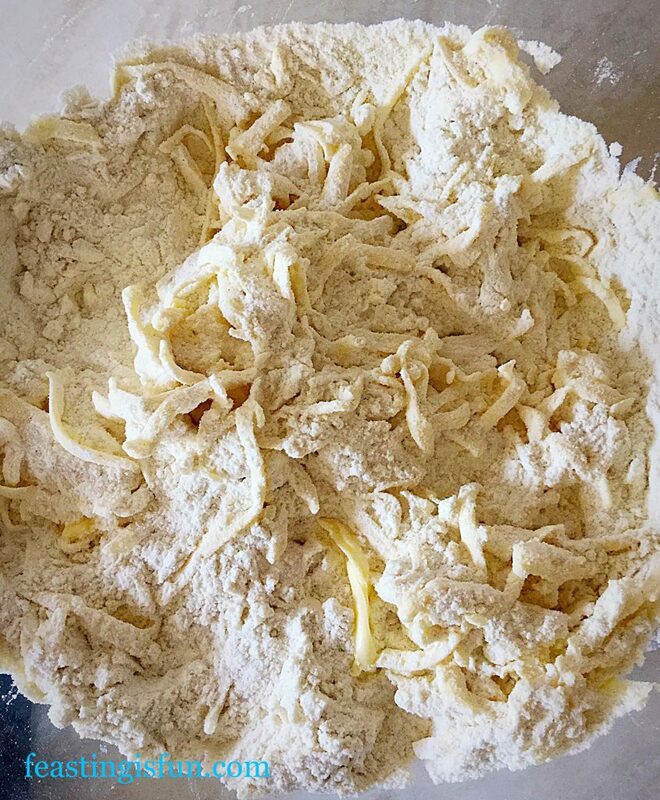 Cover the butter with flour, using a butter knife and separate any clumps, so that the butter is evenly distributed. Grated cold butter covered in seasoned flour. Next break off chunks of the Beauvale Cheese and drop them into the bowl. Golden Beauvale Cheese with a ripple of blue. Using a butter knife flick the flour over the cheese so that it is covered. This will stop it from clumping together. Chop the walnuts roughly and add to the bowl. Stir with the butter knife to distribute evenly. In a jug add 2 teaspoons of honey to the milk. Whisk briefly to disolve the honey. Make a well in the centre of the bowl and pour the milk/honey mixture in. Use the butter knife to briefly stir the ingredients and then use your hand to bring them together into a rough dough. The trick to creating the lightest scones is to handle them as little as possible and only very lightly flour the worktop on which you roll and cut them out. On a lightly flour dusted worktop tip out your scone dough and flatten with your hands so that it is 5cm/2″ deep. 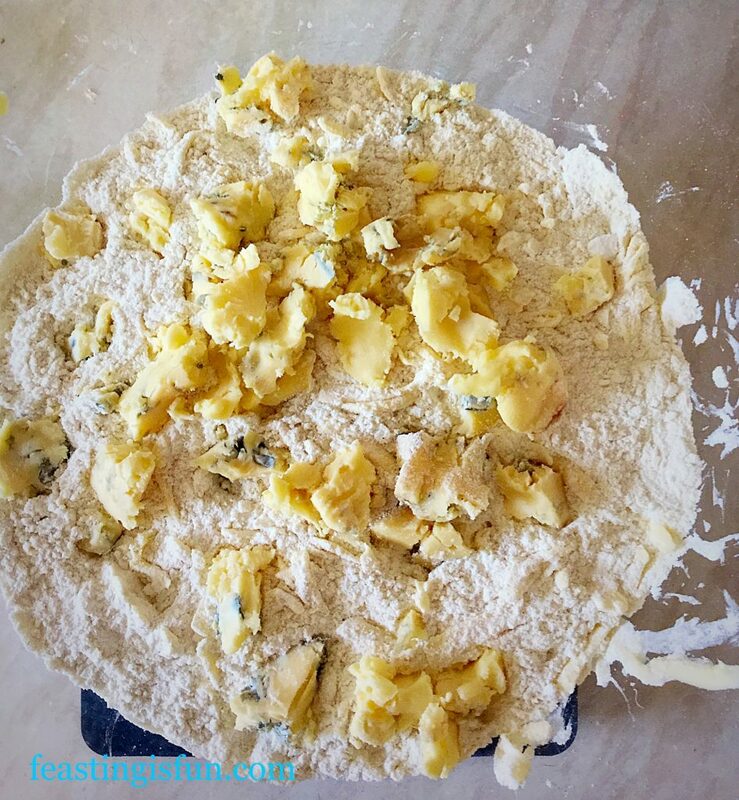 Use a rolling pin to gently roll the dough to 2.5cm/1″ thickness. Gently roll the scone dough out. 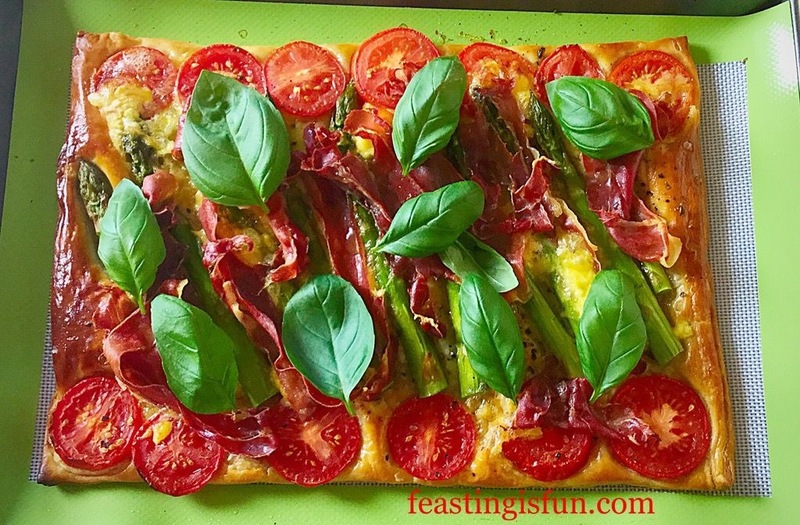 Line a large baking tray with baking parchment or a silicone baking mat. Using a 7cm/3″ cutter press straight down and cut out the scones. If you twist the cutter as you cut the scones it can cause uneven rising. Add the last teaspoon of honey to the milk, stir and then brush the tops of the scones. Beauvale Cheese Walnut Scones ready to be baked. Place the scones in the top of the preheated oven and bake for 20-25minutes, until they are risen and golden brown in colour. As soon as the scones are baked remove from the oven and place on a cooling rack – be careful as they will be hot! Beauvale Cheese Walnut Scones inhale their wonderful aroma as they come out of the oven. These utterly delicious Beauvale Cheese Walnut Scones are perfect served warm, split with butter, a little extra cheese (the contrast between the cold and baked cheese is delicious), or just on their own. Also they taste great cold and so are perfect for packed lunches, picnics and afternoon tea. 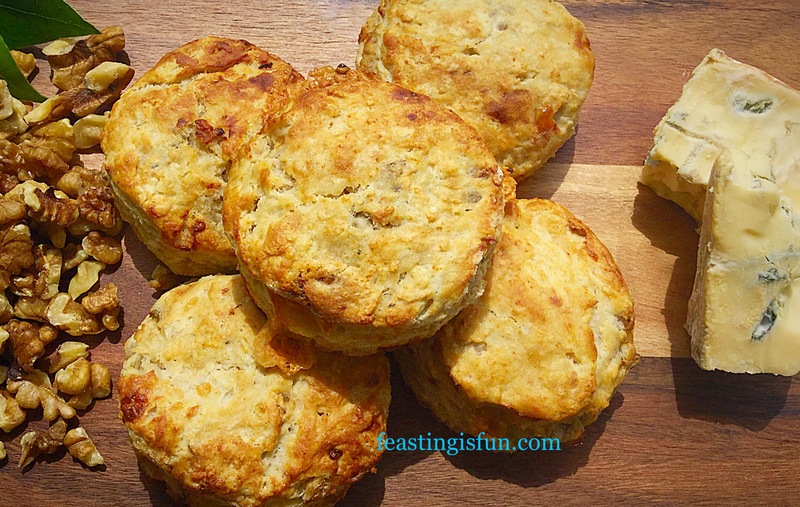 Since these scones have higher fat content, they will last 3-4 days in an airtight container. Also I have successfully frozen similar scones for up to one month. To refresh, defrost and place in a warm oven for 5-10 minutes and they’ll taste as though they’ve been freshly baked. 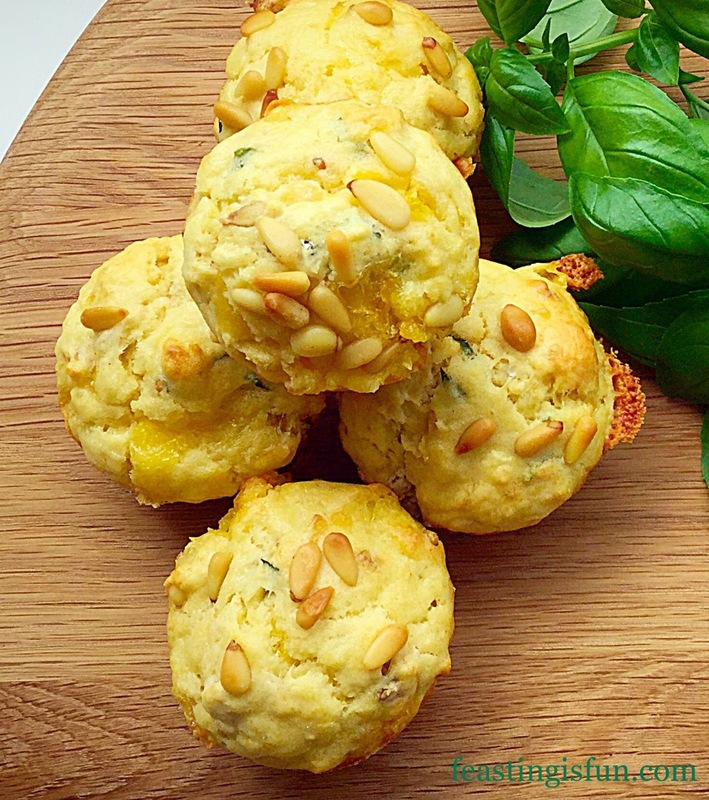 Beauvale Cheese Walnut Scones a delicious savoury treat! There are so many wonderful ways of using cheese in cooking and baking. Over the next few months we will discover together, wonderful sauces, dinners, recipes and bakes. Pong Cheese has a wonderful selection of cheeses on their website. I look forward to widening my cheese palette and creating recipes with all the different cheeses. I hope that you will join me on this creative journey and together we can have fun discovering new ways to make and bake with cheese in our kitchens? Having fun along the way as we cook up some cracking feasts. Pong Cheese provided the cheese for this recipe. All opinions, views, content and photographs are my own. This is not a sponsored post. Please see my Disclosure Policy. It is no secret that I love lemon. Whether it be in a glass of Franklin’s tonic water with clinking ice and a slice of lemon, cut into quarters as part of savoury Lemon Thyme Roast Chicken recipe, or even in a sweet bake such as my Lemon Blueberry Bundt Cake. Lemons are very versatile. And they bring sunshine into the kitchen on the dullest day’s. So let me introduce my Lemon Drizzle Cake Bars. While a sturdy, yet delicious oat biscuit base covered in lemon curd and then topped with the lightest lemon sponge ensures these bars are easy to handle. And a drizzle of fresh lemon juice icing ensures your tastebuds wake up with a zing. Resulting in a tasty bar that keeps you feeling full for longer because of the oats. 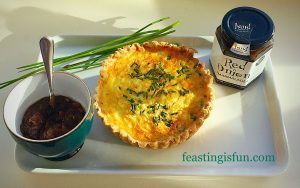 Especially ideal for picnics, packed lunches, or just as a mid morning or afternoon snack to keep you going until meal time. Although I really do need to get around to making my own lemon curd, for this recipe I used Waitrose own luxury lemon curd. Because using a good quality lemon curd makes all the difference to the overall flavour. Method: Preheat the oven to 200C/180C fan, gas mark 6, 400F. First of all, line a 28cm x 20cm x 5cm (12″x 8″x 2″) Swiss roll tin with baking parchment. I have found that I am able to line mine without greasing, however, lightly grease the tin if it is easier to keep the parchment in place. In a large bowl beat/whisk together the butter, cream and salt until pale and creamy. Add the vanilla extract and egg yolk and continue to beat/whisk until combined. Add the oats and flour and stir together until combined. Place the biscuit mixture into the lined tin and press into place using clean fingers. Place the tin in the fridge and chill the biscuit mixture for 30 minutes. As soon as it is chilled place the Swiss roll tin in the centre of the oven and bake for 20 minutes. Remove after the 20 minutes has elapsed and turn down the oven temperature to 160C/140C fan, gas mark 3. 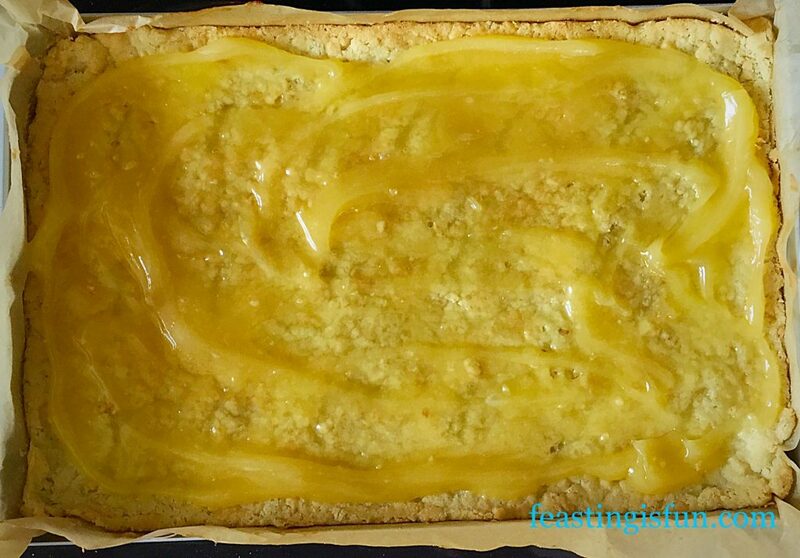 Spoon the lemon curd on to the hot biscuit base and spread so that it covers and almost reaches the edges. This tangy lemon curd layer makes all the difference to the finished bake. Note: This can easily be made whilst the oat biscuit base is baking. In a large bowl whisk/beat the butter, sugar and salt together until they are pale and creamy. Add the 2 whole eggs and vanilla extract. Whisk/beat until light and foamy. Sift in the flour and baking powder. Add the finely grated zest of 1 lemon. Fold all the ingredients together, using a spoon, until they are just combined. Spoon the mixture over the lemon curd coated biscuit base. Spoon the cake batter evenly over the base. Spread the cake batter using the back of a spoon, or an offset spatula, until it covers almost all of the biscuit base. 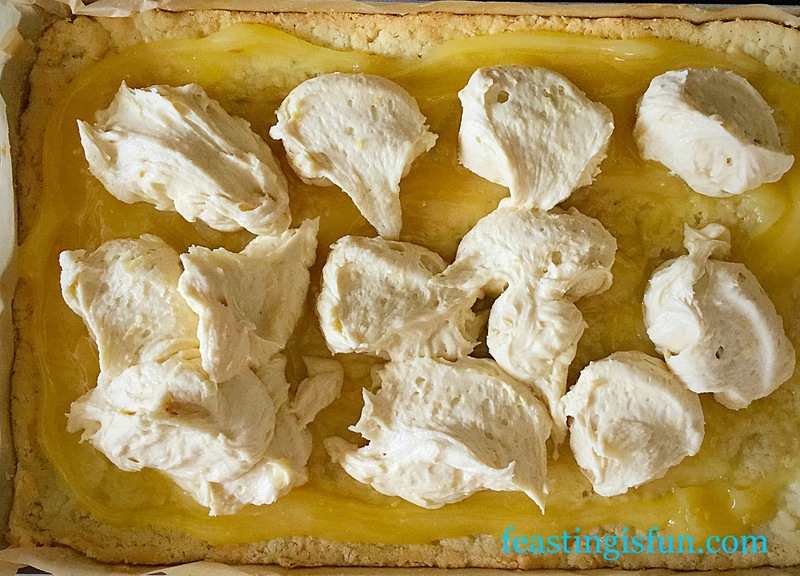 The lemon cake batter will spread to completely cover the biscuit base whilst baking. 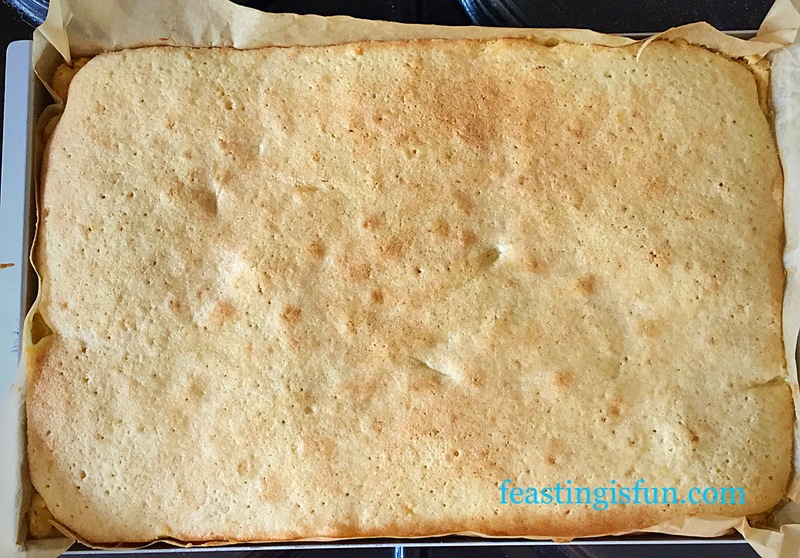 Place the Swiss roll tin in the centre of the preheated oven and bake for 30 minutes. The sponge is baked when it springs back from a light touch and is a light golden colour. Don’t worry if it is paler than you expect, the lower baking temperature stops it browning as much as you may be used to. 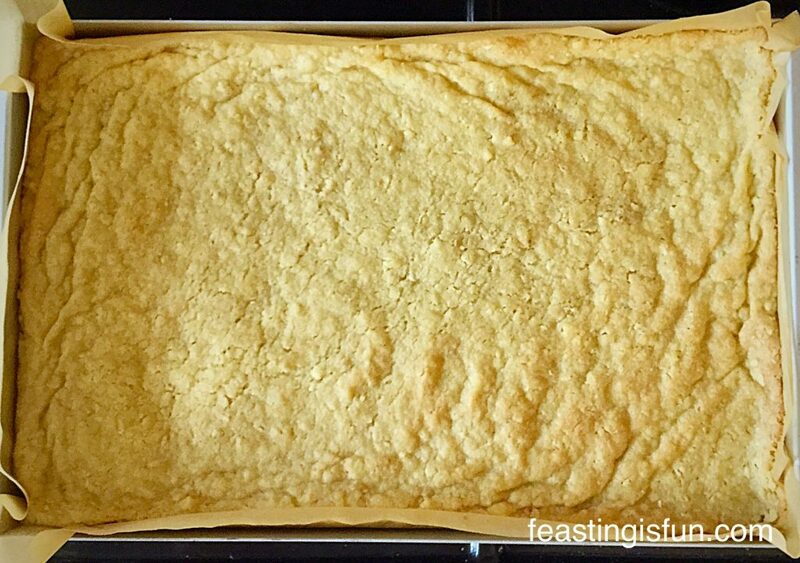 As soon as the sponge is baked remove the tin from the oven, place on a cooling rack and allow the entire bake to cool in the tin. 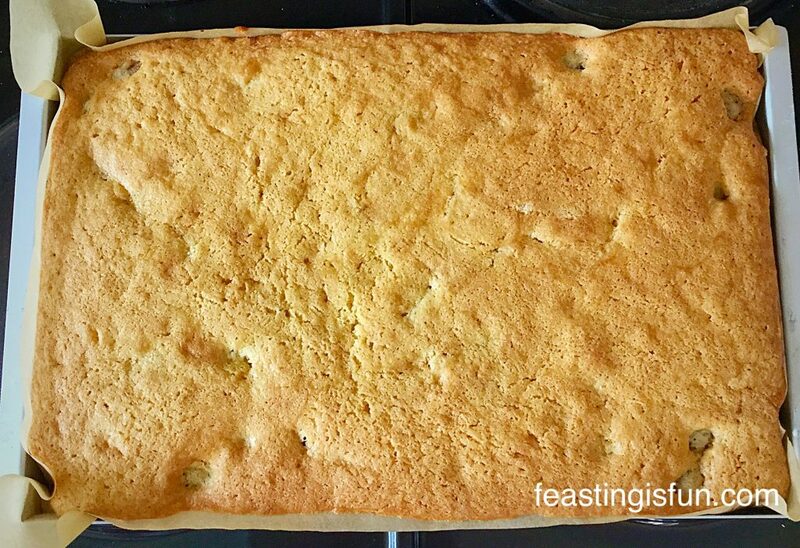 The entire slab of sponge topped biscuit cooling in it’s tin. 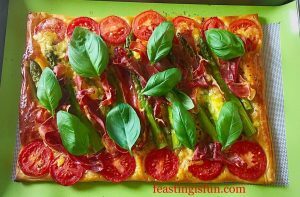 When the bake is completely cooled, lift out of the tin, using the baking parchment and a palette knife and place on to a board. Peel back the sides of the baking parchment and tuck them underneath. Sift the icing sugar into a small bowl. Add the juice of one lemon. Mix until you have a smooth, slightly runny paste. 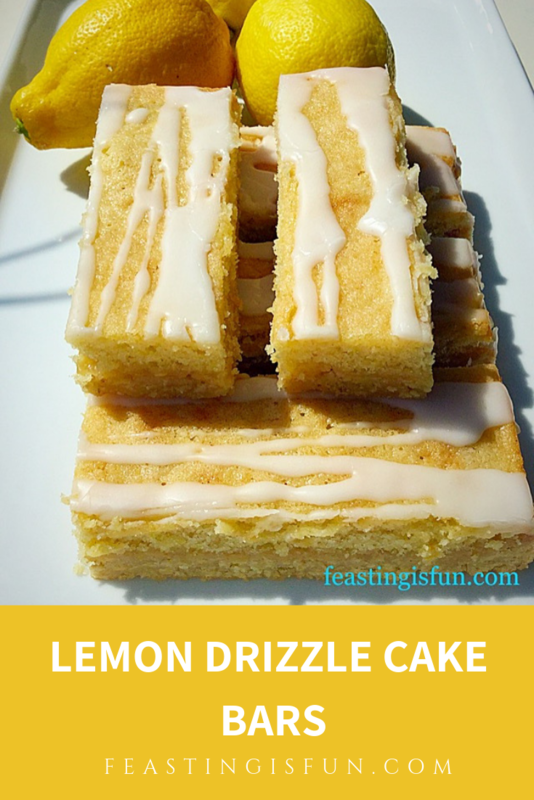 Using a spoon, drizzle the lemon icing over the top of the cake/biscuit slab. I prefer a line style drizzle, but you can drizzle your icing however you wish. Let your creative juices flow! Although I do advise against pools of icing gathering on top of the bake. 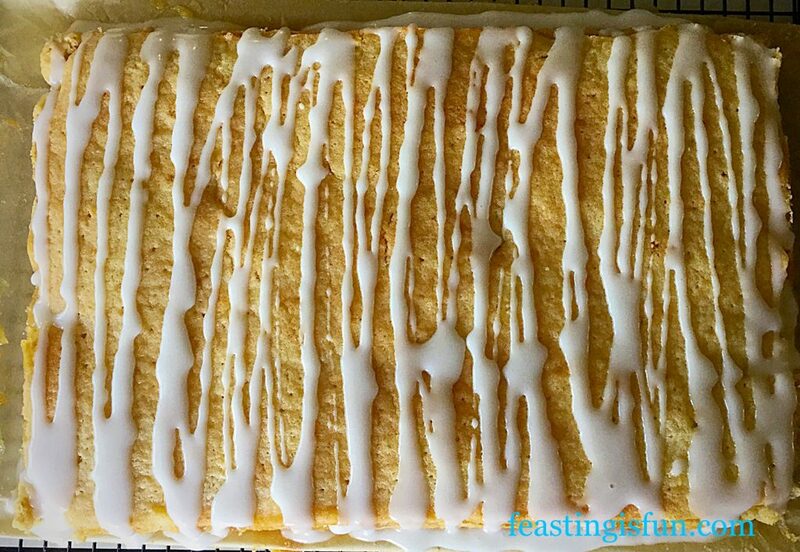 Set your Lemon Drizzle Cake Bars bake to one side to allow the icing to set. 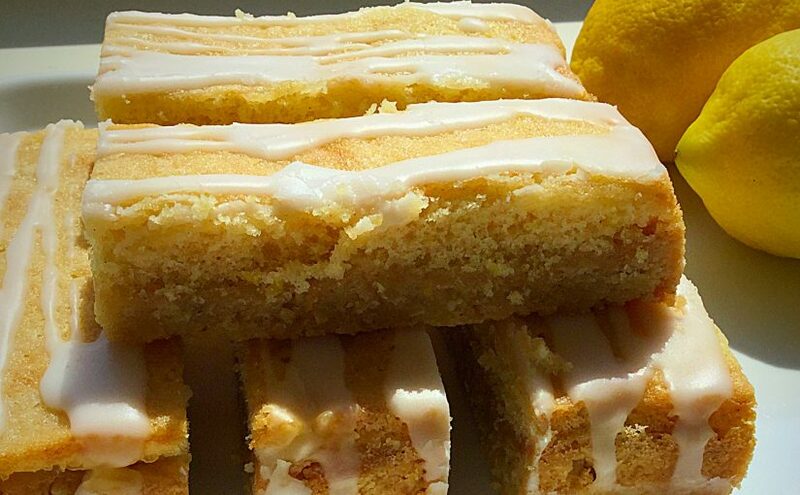 Lemon Drizzle Cake Bars the tart lemon icing gives these a professional finishing touch. Once set you may cut your slab into individual bars. Cut down the length of the bake in the middle. Next cut across the width of the bake, creating four quarters. Cut each quarter into four individual bars. 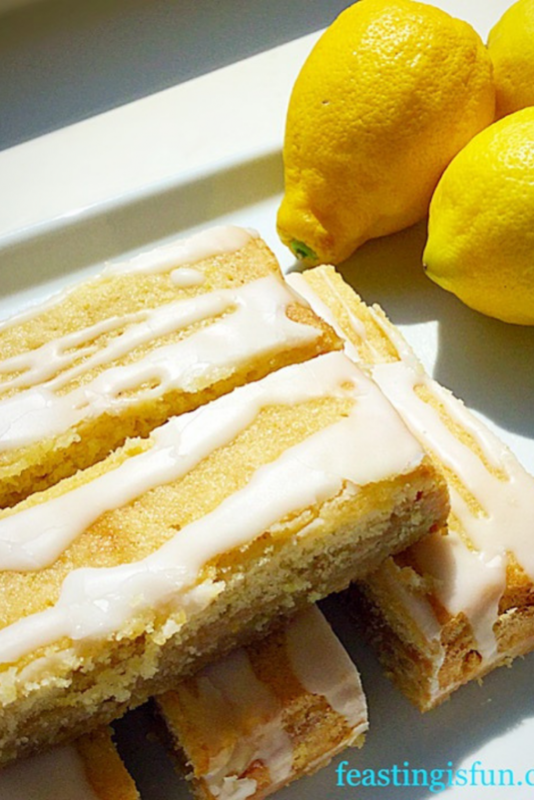 Lemon Drizzle Cake Bars gloriously tempting in the sunshine. 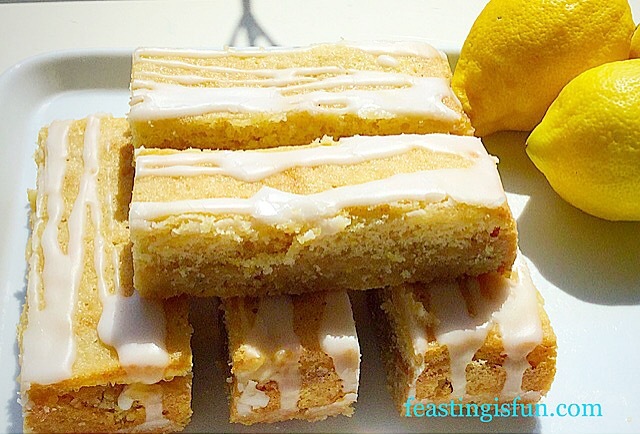 Because of the sturdy and delicious oat biscuit base, these Lemon Drizzle Cake Bars are the perfect, portable food. Store in an airtight tin (I use old biscuit tins, usually from Christmas), separating layers with pieces of baking parchment and eat with 5 days. 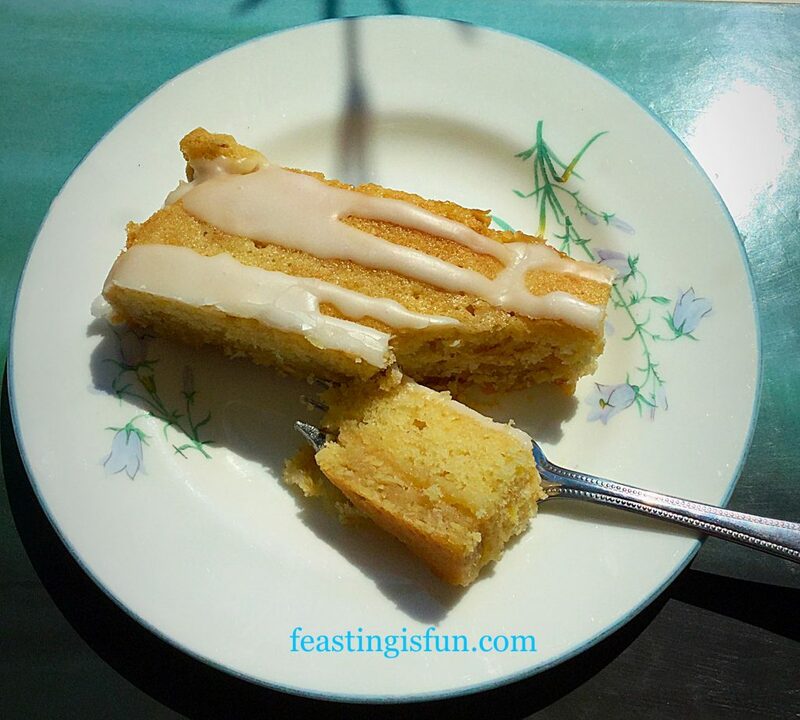 I had one of the Lemon Drizzle Cake Bars with a cup of tea for a rather late lunch and it was incredibly tasty and refreshing. While using good quality Lemon Curd ensures the right balance of tartness within the bar, as does using fresh lemon juice in the drizzle icing. So I highly recommend these delightfully tangy Lemon Drizzle Cake Bars! 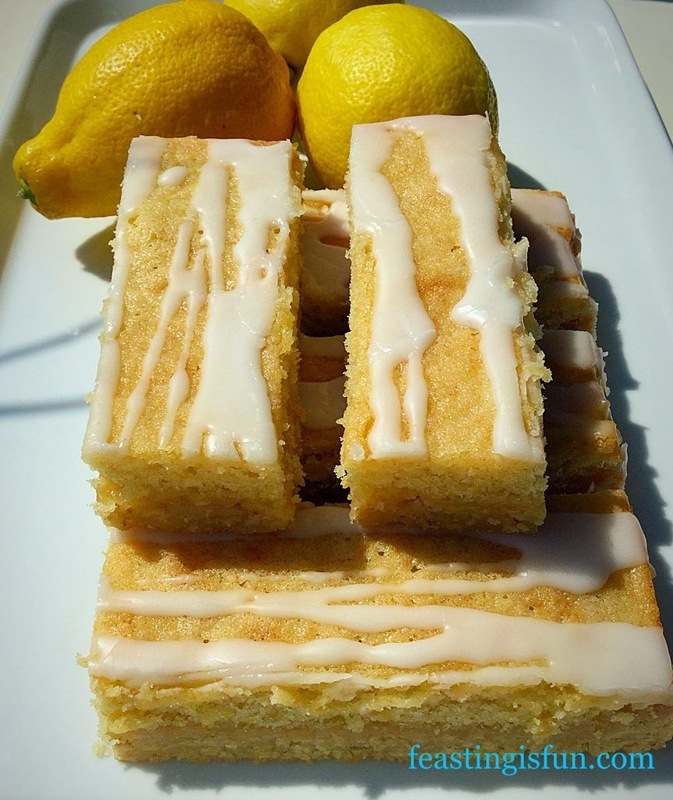 Lemon Drizzle Cake Bars perfect for Afternoon Tea. Since my family love having something homemade to take to school or work in their packed lunches these bars are ideal. 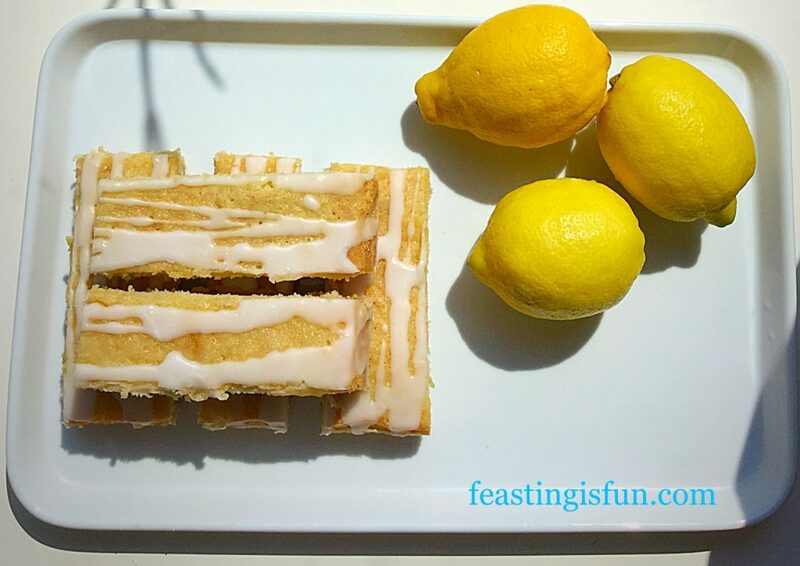 Also I hope I have inspired you to try these delicious Lemon Drizzle Cake Bars. Alternatively, why not bake a batch and take them into the office as a Friday, or mid-week treat for everyone? Finally, whatever you are making, baking and creating in your kitchen, have fun preparing and sharing your feast. Hi lovelies, thank you so much for stopping by and taking a look at what I’ve been cooking up lately. Whilst the sun is still shining and the sky a most glorious blue colour, my mind is once again on portable food. Picnics, packed lunches, outdoor parties, or even just something to have mid morning with a cup of coffee in the garden. 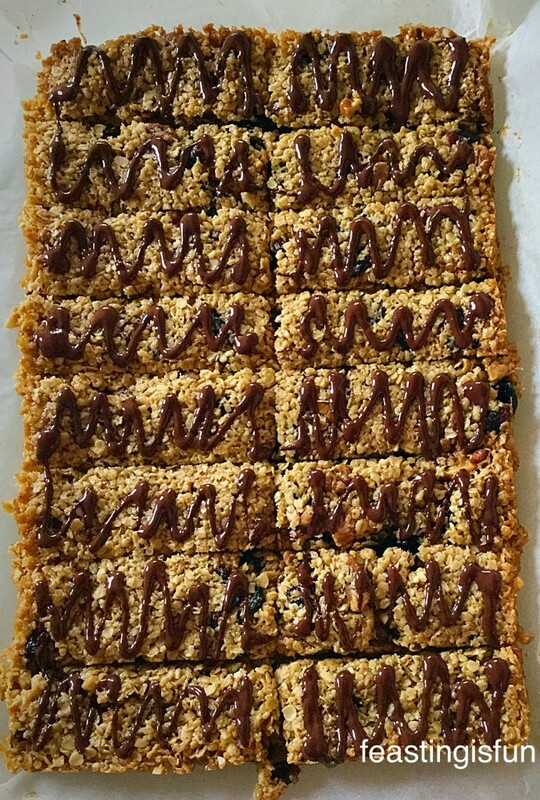 May I present these Double Cherry Drizzle Oat Bars! Double Cherry Drizzle Oat Bars swirly, sparkly deliciousness. 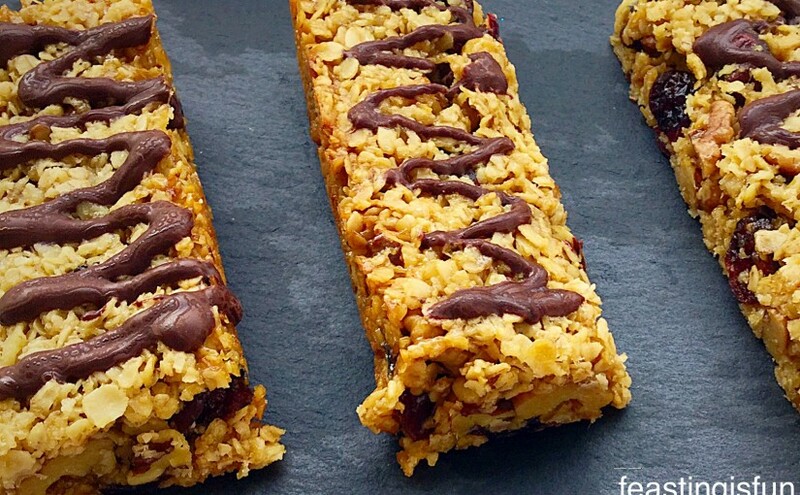 A crunchy oat biscuit provides the base for these delicious bars. Topped with cherry jam and then a thick layer of light, vanilla sponge studded throughout with glacé cherries. 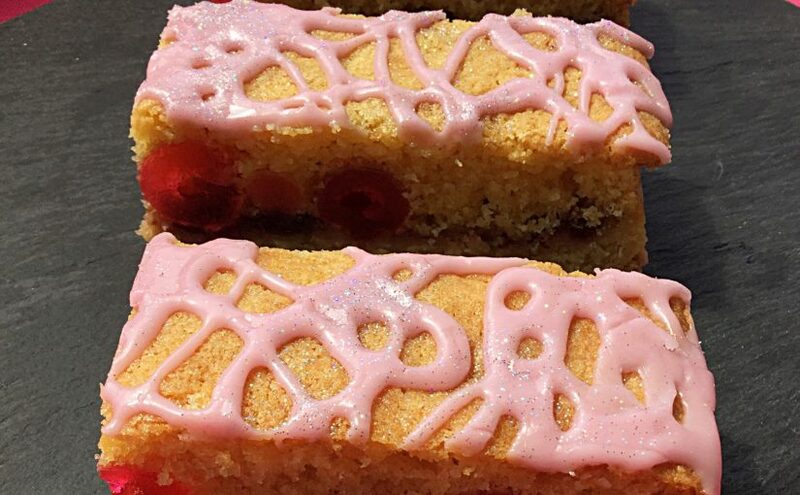 The Double Cherry Drizzle Oat Bars are then finished with a drizzle of cherry icing and a sprinkle of edible glitter! 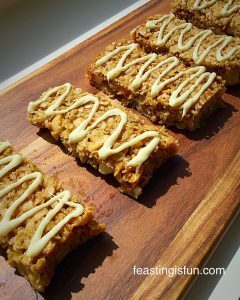 Double Cherry Drizzle Oat Bars perfect with a cup of tea. Incredibly tasty, these bars also hold together really well, very important when being packed up for lunch or a picnic. Feel free to sit in the sun with a cup of coffee and one of these Double Cherry Drizzle Oat Bars and simply stare at how beautiful and sparkly they are. Double Cherry Drizzle Oat Bars if you like cherries then you will love these. For an afternoon tea, you could easily cut these into 24 smaller, bite sized delights – in fact, if you decide to do that, it may well be worth icing them after they have been cut. 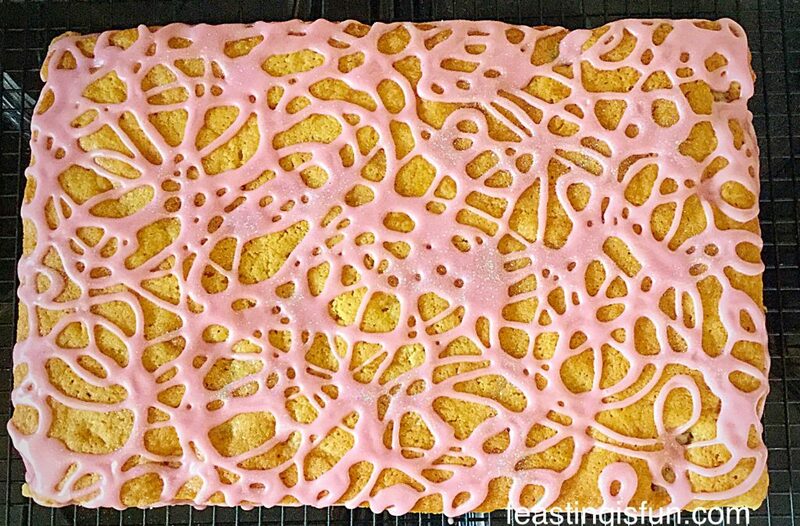 That way you can loop the icing around each individual square, making them look even more elegant. No matter whether you make these as beautiful bars or simple, elegant squares, there is one thing guarenteed and that is they taste amazing. A perfect combination of pretty and pretty yummy! Lightly grease and line with baking parchment a 28cm x 20cm x 5cm (12″ x 8″ x 2″) swiss roll tin. In a large bowl add the butter and sugar and whisk/beat until pale and creamy. 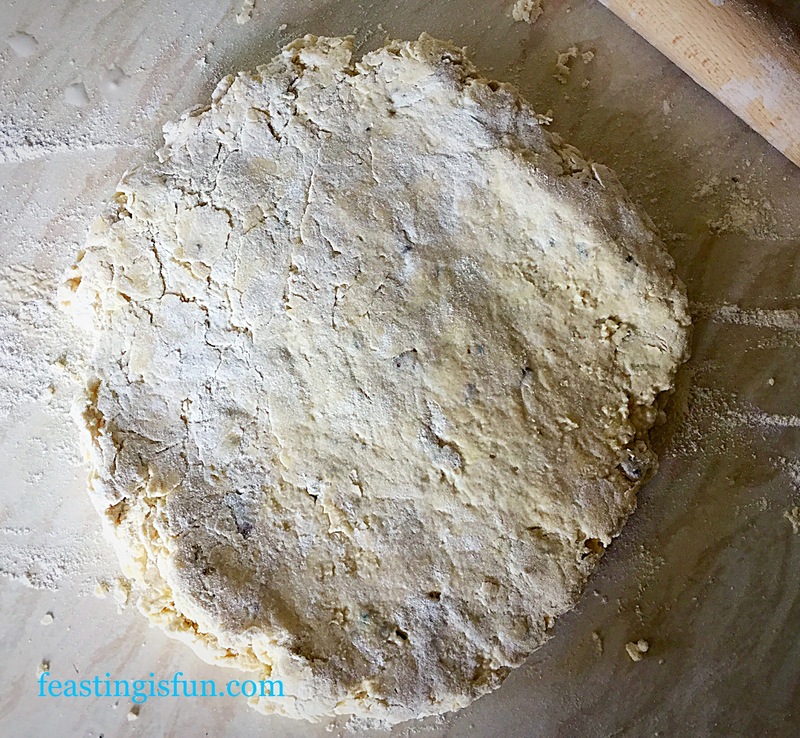 Add the oats, flour and salt and mix gently until the dough just comes together. Tip the biscuit dough into the prepared pan and press into a single, even layer with your fingers. 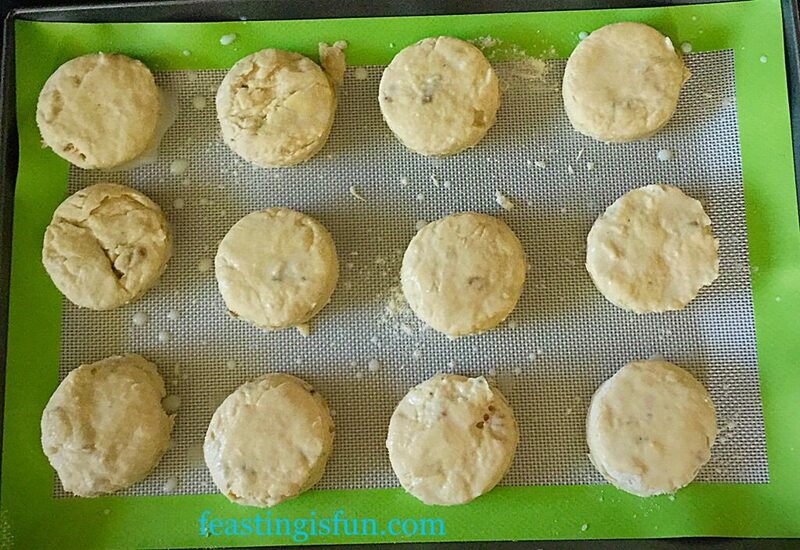 Place the tin in the fridge for at least 30 minutes to allow the dough to rest. After the dough has chilled place the tin into the centre of the oven and bake for 20 minutes. The biscuit base will be a lovely golden colour. Once the cooking time has elapsed remove the tin from the oven. Beautifully golden oat biscuit base. Whilst the biscuit base is hot spoon over the cherry jam so that it covers the base but does not spread right to the edges. Delicious morello cherry jam spread over the biscuit base. Reduce the oven temperature to 160C/140C fan, gas mark 3. In a large bowl cream together the butter and sugar until pale and creamy. Add all 3 eggs and the vanilla extract. Whisk/beat until combined. Reseve 1 tablespoon of the flour and sift the rest of the flour, salt and baking powder into the bowl. Mix until the ingredients are just combined. 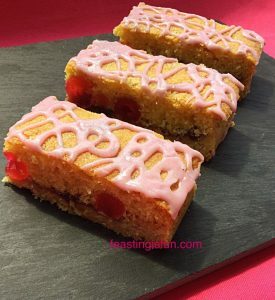 In a separate bowl toss the cherries in the reserved flour – this will prevent them sinking to the bottom of the cake whilst baking – although the cake layer in this Double Cherry Drizzle Oat Bars is not very deep, it is a good tip to remember. Add the flour dusted glacé cherries to the cake batter and mix gently so that they are evenly dispersed. 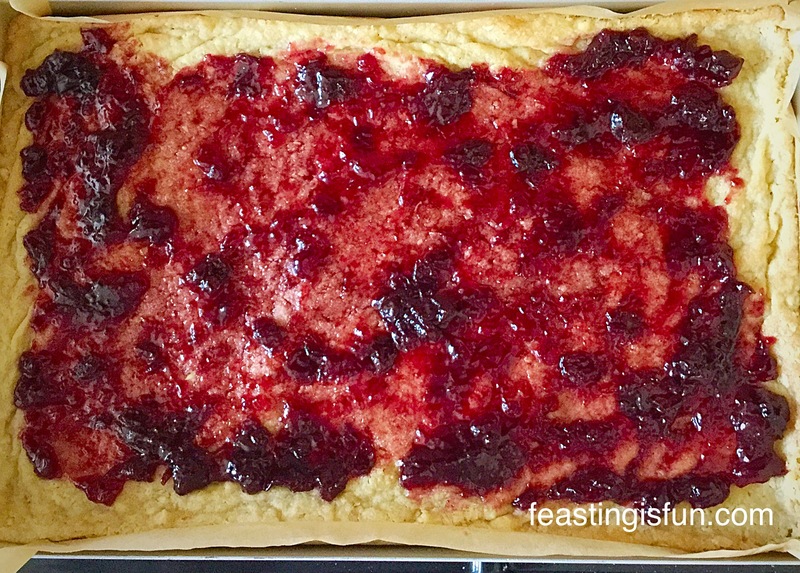 Using a spoon, evenly dollop the cake batter over the biscuit/jam base. Spread out the cake batter until it almost reaches the edges – I used the back of a metal spoon. The cake will spread to fill the pan whilst baking. Double Cherry Drizzle Oat Bars ready for the oven. Place the tin into the centre of the oven and bake for 30-35 minutes. The cake layer is baked with it is a golden colour and springs back from a light touch. When baked remove the tin from the oven. 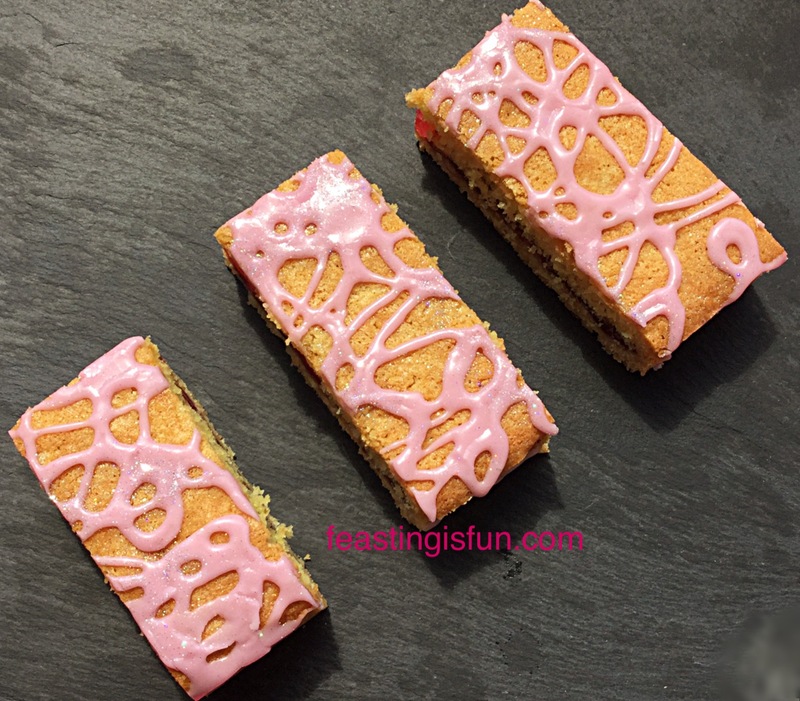 Double Cherry Drizzle Oat Bars a beautiful golden colour when baked. 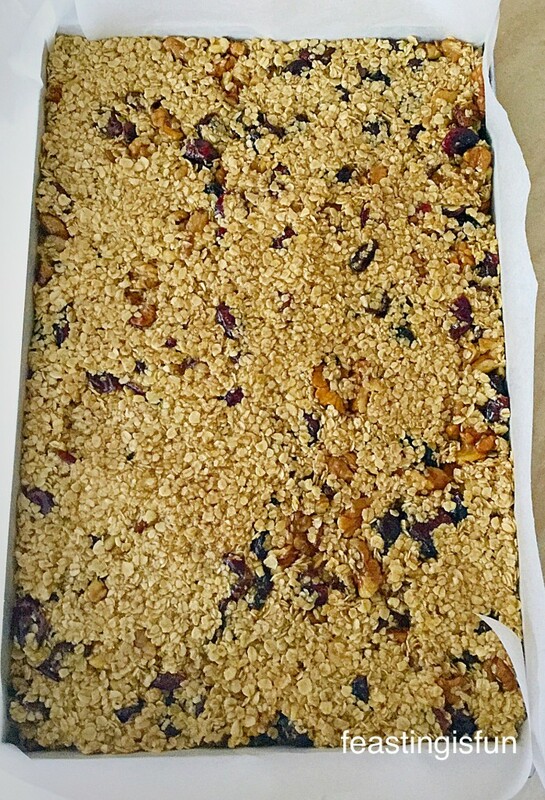 Allow the Double Cherry Drizzle Oat Bars to cool completely in the tin. When cooled invert onto a baking rack and carefully remove the baking parchment. Place another cooling rack on top of the tray bake and flip over again, your bake should now be cake side up. Sift the icing sugar into a medium sized bowl. Add the cherry syrup and stir. Next add 3 teaspoons of cool tap water and the almond extract. Stir to combine. You will have a thick, icing that will just hold it’s shape when piped. 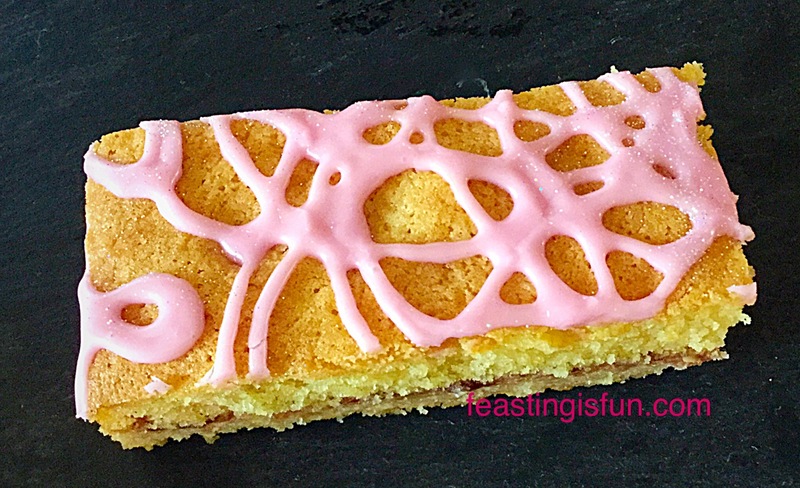 Fill a small disposable piping bag with the pink, cherry icing. Snip the very end of, leaving a small hole. 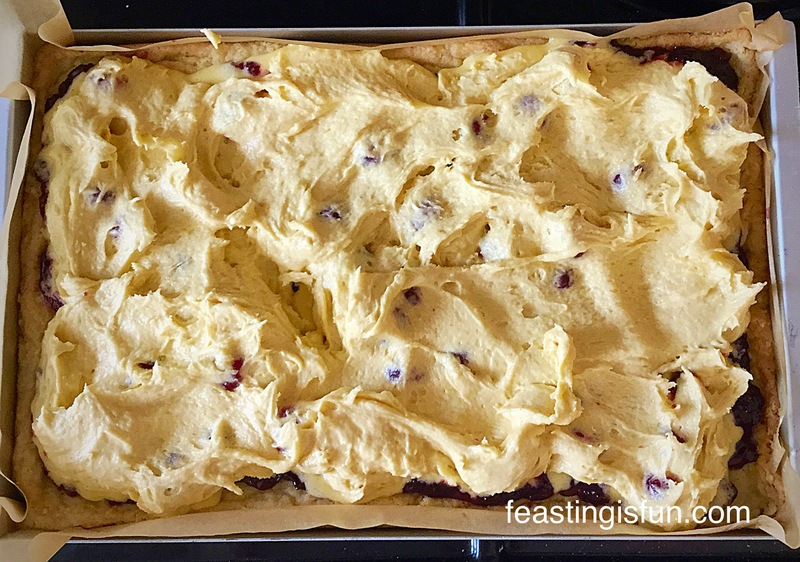 Pipe swirls and squiggles all over the top of the tray bake. Alternatively, use a teaspoon to lightly drizzle the icing over. Dust with a sprinkle of your favourite edible glitter, if desired. 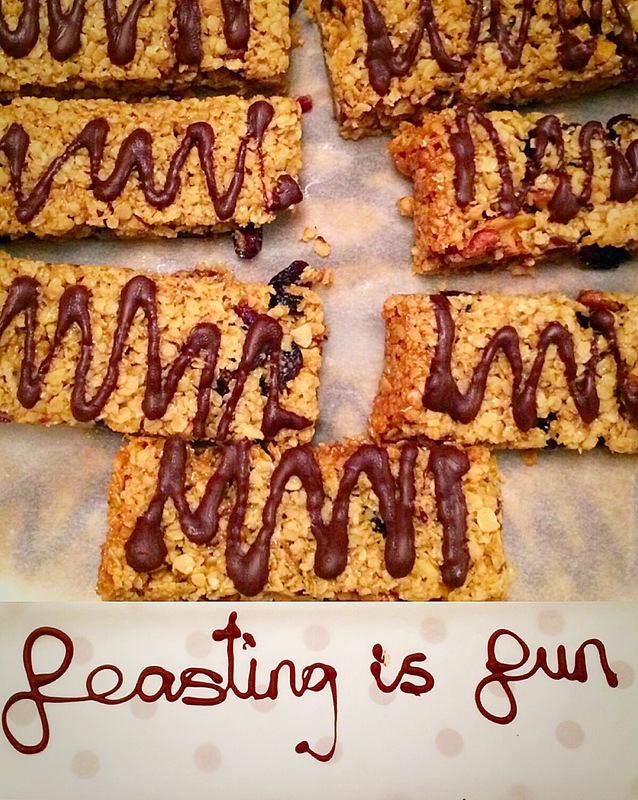 Double Cherry Drizzle Oat Bars decorated in black cherry swirled icing. Allow the drizzle to completely set before slicing. Transfer the Double Cherry Drizzle Oat Bar slab onto a flat surface – I use a glass kitchen saver – don’t use your best knife for cutting as the glass will blunt it! 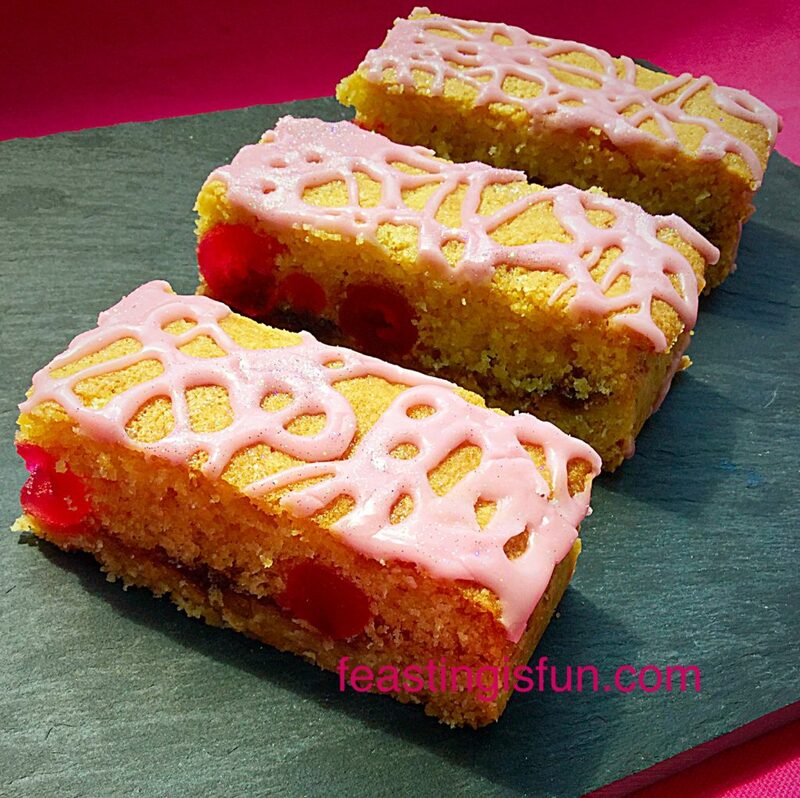 Double Cherry Drizzle Oat Bars sparkling in the sunshine. Take lots of photos of these utterly dazzling Double Cherry Drizzle Oat Bars just because they are so pretty! Also don’t forget to pop a picture on Twitter/Instagram, tag me in and I will retweet, or give you a shout out. 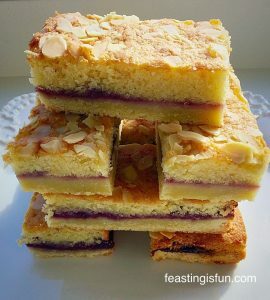 I know in previous posts that I’ve mentioned not taking ‘anything’ iced on picnics – however, these bars are so completely delicious I’m going to make an exception. The nutty flavoured oat base and hint of almond extract in the cherry drizzle work together in complete harmony with the cherry studded sponge creating a perfectly flavour balanced bar. They stop the Double Cherry Drizzle Oat Bars from being too sweet. Macadamia Apricot Flapjacks delicious oaty goodness. 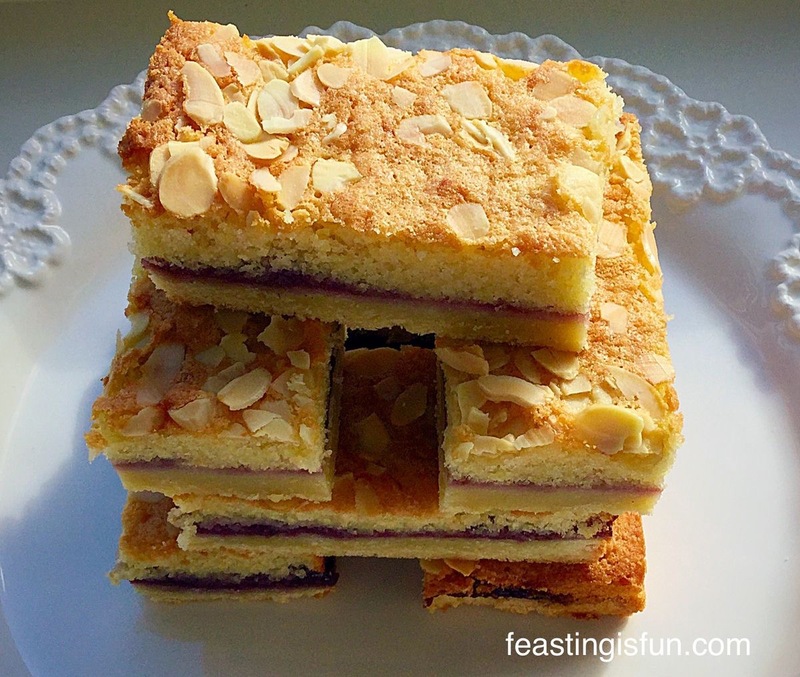 Bakewell Sortbread Bars utterly yummy. 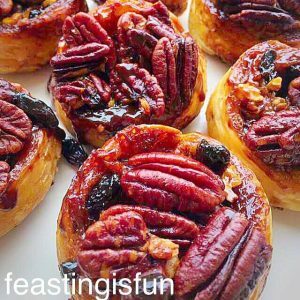 Sticky Pecan Sultana Buns so easy to make and incredibly delicious to eat. Eating outside, whether on a picnic, at a barbecue or even in the garden, is such a great way of getting together with friends old and new. There is something so informal and relaxing being in the great outdoors. I can see why so many people choose to get married outside, as it’s a great way of mingling a diverse combination of guests in a relatively informal environment. We are planning a fab get together with our friends and neighbours over the coming weeks, so watch out for fun, feasting and barbecue recipes coming up. Are you planning on any outdoor get together’s? Do you enjoy the great outdoors – even if it’s only your back garden? Gosh mornings are busy. So much to do, yet so little time. Besides that awe are supposed to make time for the most important meal of the day – breakfast. Well I have a solution right here for you my friends – Cranberry Walnut Flapjacks. 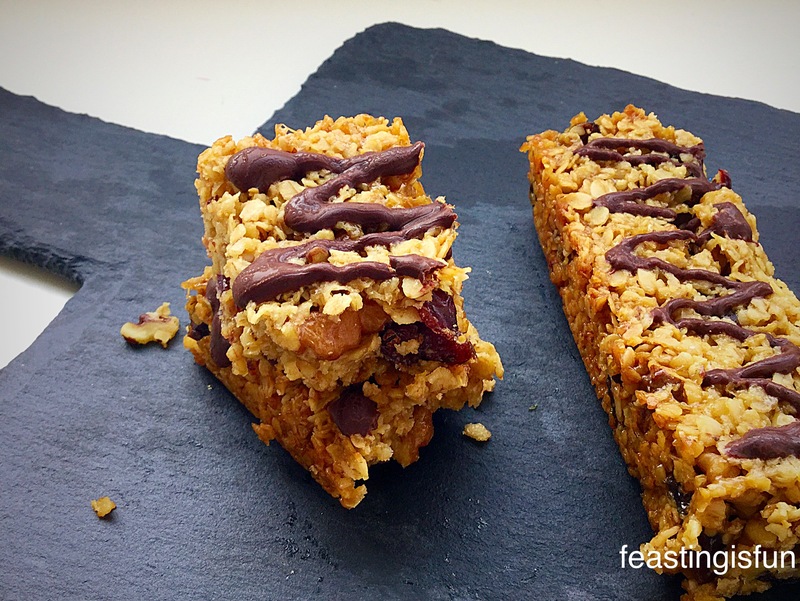 Cranberry Walnut Flapjacks perfect for breakfast on the go. Breakfast, is just that – breaking the fast. Our bodies have just been starved for 6-7 hours (I’m being optimistic here), whilst we sleep. Eating a good breakfast helps kick our bodies into GO. If you are anything like me, I need a kick start in the morning! That’s where these yummy Cranberry Walnut Flapjacks can help. Packed full of good-for-you, slow release energy oats, one of these bars will keep you going until lunchtime. And, because it’s the morning and let’s face it eating anything can be a struggle, I threw in crunchy walnuts and chewy, slightly tart cranberries. Yes there’s a squiggle of rich, dark chocolate on top of these beauties – it’s breakfast people, we need all the caffeine flavour we can get!! Cranberry Walnut Flapjacks the perfect start to your day. The beauty of these flavour and texture packed bars is that you make them ahead. Imagine this? It’s Sunday afternoon, you spend 15 minutes in the kitchen, whipping up a batch of these Cranberry Walnut Flapjacks and you have breakfast and snacks for the whole week. Am I the only one who gets that mid afternoon dip around 3-4pm? Also these bars also make a great mid afternoon snack and stop you grabbing for that chocolate bar/doughnut/cookie. Because we all know these give us an instant feel good sugar hit, only to slump in hunger again half an hour later. Therefore, why not wrap an extra one of these, in baking parchment and take it to work? It’ll keep those hunger pangs away until dinner time. Wrap up one of the Cranberry Walnut Flapjacks and take it with you. You can certainly mix up the fruit and nut element. Dried apricots with almonds, or dried figs with pecan nuts. Really the possibilities are endless, I would keep the weights the same, as the flapjack needs to hold together. I have deliberately not used the word ‘healthy’ for these Cranberry Walnut Flapjacks, as I am aware of the sugar/butter content. I am not a nutritionist, although I would rather pop one of these bars into my daughter’s hand as she heads off for college, than have her grab a muffin or doughnut from a coffee shop! 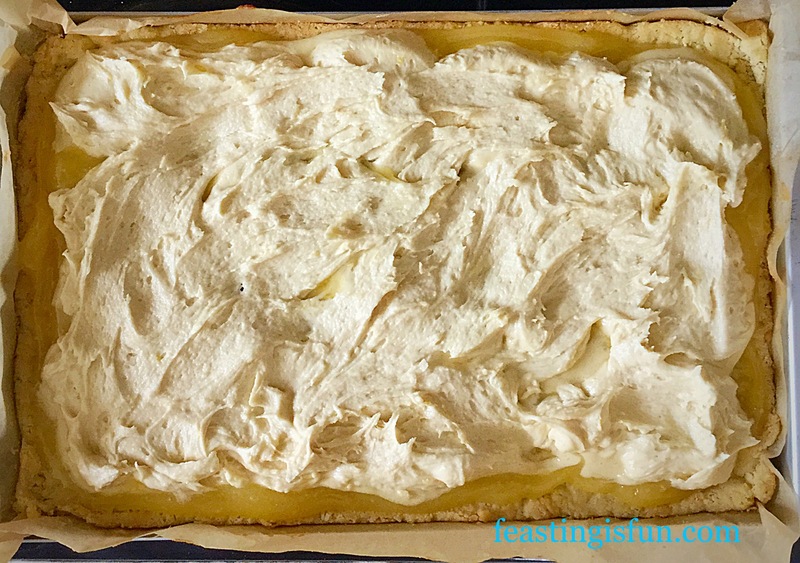 First of all, grease and line a 8″ x 11″ – 20cm x 28cm swiss roll tin/shallow baking tin, with butter and baking parchment. Into a large bowl add the golden syrup. Into a medium saucepan add the butter and sugar. Warm over a medium heat, stirring until melted. Pour the melted butter/sugar mixture into the bowl containing the golden syrup. Stir continuously until combined. 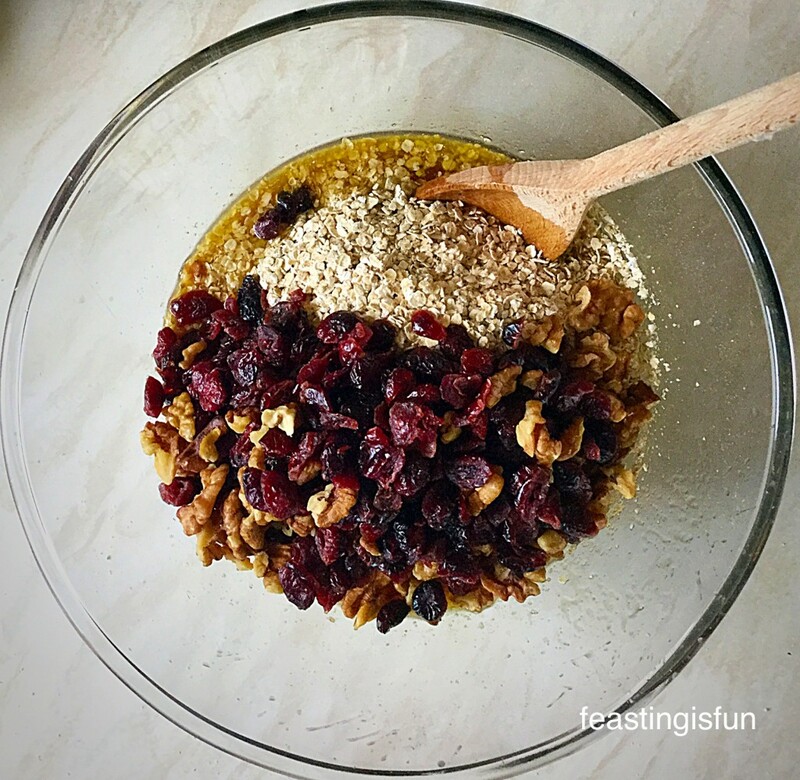 Add the oats, cranberries and walnuts to the bowl. Stir until all the oats, walnuts and cranberries are thoroughly coated in the melted butter/sugar. Tip the mixture into the lined tin. Using the back of a metal spoon press the mixture into the tin, forming an even layer. Place the tin into the oven and bake for 20 minutes until golden brown. Remove the tin from the oven and allow the Cranberry Walnut Flapjacks to cool in the tin. The flapjacks will be very soft at this stage, but will harden on cooling. When the flapjacks are slightly warm, remove from the tin. Using a sharp knife cut down the centre of the flapjacks. Then cut across the middle. Cut each quarter in half again. The flapjacks will still be slight soft. Leave the flapjacks on the baking parchment to continue cooling and setting. 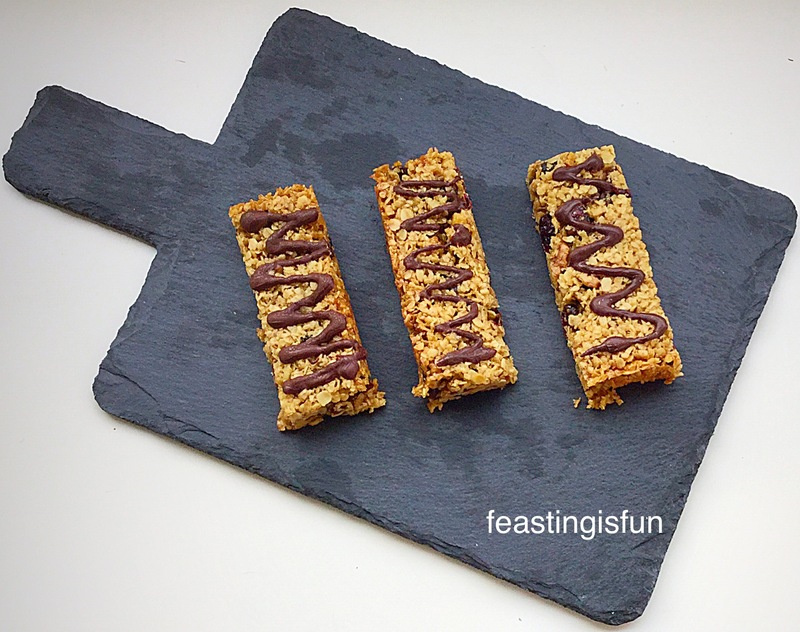 As soon as the Cranberry Walnut Flapjacks are completely cooled they can be drizzled with chocolate. Break the chocolate into small pieces and melt in a heatproof bowl, in the microwave, using 30 second bursts. Stir well and when the chocolate is nearly melted keep stirring and the inherent heat will melt any solid pieces left. 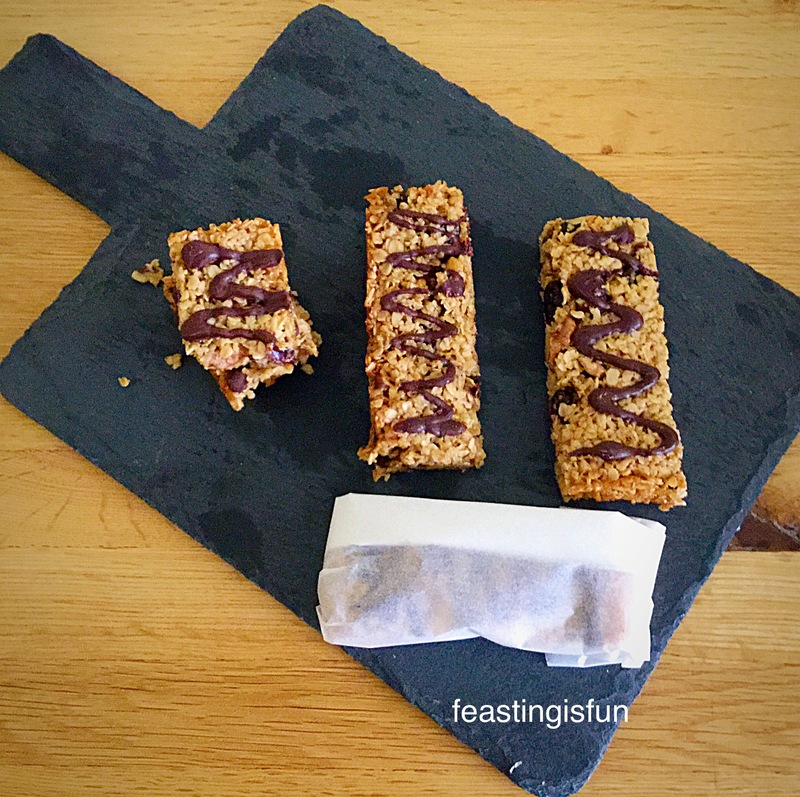 You can use a teaspoon to drizzle the chocolate over the flapjacks or pour the chocolate into a disposable icing bag, snip the corner off and pipe the chocolate on. Allow the chocolate to set and then store in a tin. Store layered with baking parchment in a tin. While Cranberry Walnut Flapjacks are perfect anytime of day, they are especially handy to have, when time for breakfast disappears in the morning. Just grab one and eat on the go! An added bonus, which does rely on checking the packaging, is that oats are gluten free. So even more people can enjoy a delicious, easy breakfast. 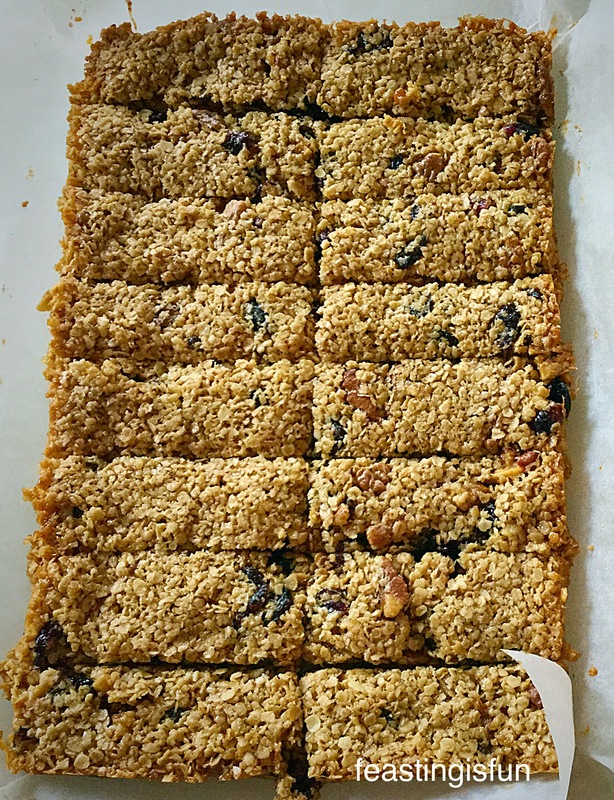 Why not bake a batch of these flapjacks and take them to work? Since I’m sure they would be appreciated. Especially by those who have skipped breakfast!